What do I need to know about traveling to Dubai during Ramadan? I bought tickets to Dubai for the summer for a small vacation (first week of July). Unfortunately, I did not realize it was during Ramadan. I have been told by a few acquaintances that the laws in Dubai are especially strict during Ramadan and you can even receive citations for drinking water (given that it's almost the hottest month of the year, this seems miserable). Additionally, I have heard that many places are closed (such as bars/clubs) and there is far less to do in the city. I will be traveling with my girlfriend. We were told by one of her friends in Dubai that she does not feel comfortable letting us stay with her because we are unmarried and she could be fined or get into legal trouble if she housed us. I am not Muslim and do not follow any Muslim traditions/customs. Are any of these things true and would they apply to me as a foreigner? Is there any other useful information an ignorant American like me should know about the city during Ramadan with regards to the customs during that time? I would like to be as respectful as possible but I'd still like to have a good time in the city (or even neighboring cities). 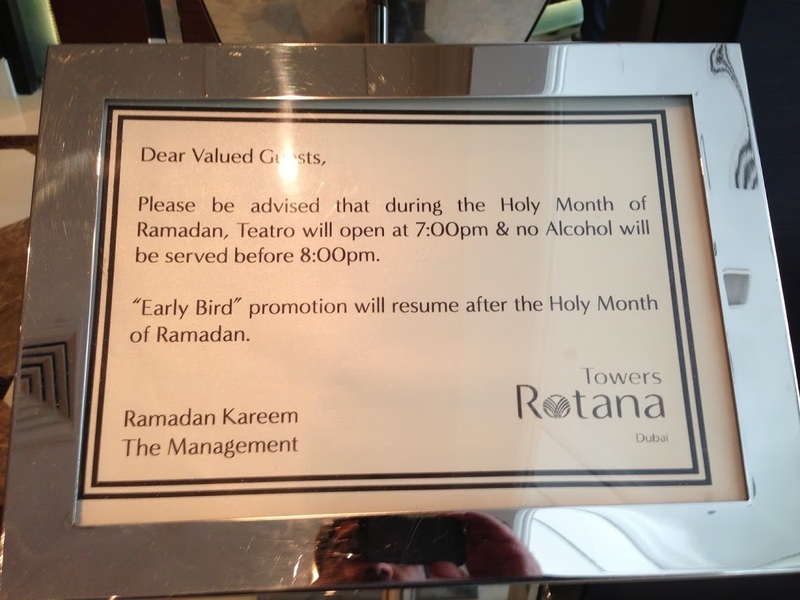 In Dubai Mall, during Ramadan (daytime) eating is allowed but not in any restaurant. There is a designated cordoned off area where you must take your food and are only allowed to eat there. Restaurants that are open will only offer take away service. No food establishments are open until after sunset; this includes hotel bars, restaurants, etc. You are not allowed to eat, drink or smoke in public (this applies to everyone, with the exception of children). There are extended prayers during the evening. You may be able to order room service if you are staying at a hotel, but keep in mind that in the UAE - it is illegal for non-married couples to cohabitate (this is not something specific to Ramadan, but in general). If you are staying in a hotel, you might want to check their policies on room service during Ramadan. As far as dressing is concerned, I would say use your common sense. In all malls there is a sign describing the rules and guidelines (such as no pets, no skating, no smoking and the dress code). No bare shoulders (for both men and women). No short-shorts or mini skirts (these are only appropriate in clubs, not in malls or when in public). No offensive clothing (such as shirts with offensive words/phrases). No transparent tops or see through dresses. The more you are respectful to the culture, the better treatment you will get. If your clothing is breaking the rules in the extreme, you may be pulled aside by mall security and asked to leave (this has happened in front of me once, to a lady who thought it was okay to wear a see through tank top and her bathing suit at Dubai Mall). I have returned from my trip and would like to share some of my insight. The other answers here are similar to what I experienced so I thought it would be useful to share additional information that I wish I had known before traveling. Note that I stayed in the Dubai Marina area which has many more Westerners than older parts of the city (such as Deira) and is less conservative in general. I would like to say that doing a few mosque tours gave me a much greater appreciation of Ramadan and Muslim culture in general. Ramadan is as much about following religious principles as it is about being aware of our own habits and the things we take for granted. It is a time of giving and family (such as the communal Iftars in the evening). If you view Ramadan in a positive light rather than an inconvenience I think you will have a much better time in the city and find it easier to respect the cultural norms. Many of the restaurants in the New Dubai/Marina area offer carryout services with special Ramadan hours. Many also offer free delivery. If you plan ahead a little, it is easy to order and bring it back to your room to eat if you don't want room service (or in my case I was in an AirBnB). Just be careful when you are in elevators or crowded spaces - Muslims should not even smell the food you are carrying around. I read on some of the links above that some restaurants have covered areas that are considered "private" so you can still eat there. The only place I saw them was in the Atantis resort on the palm. Plan your day carefully (huge breakfast) and bring non-perishable food + water in your bag when you travel. It will be very hot and you will be hungry. Bathrooms are found in every metro and extremely convenient for stopping for a quick (quiet) snack. Just be respectful of those around you. If you are planning to do any sort of tours they will generally still allow food. I participated in a desert safari and a boat tour in Oman and both still offered food since we were in a private area away from the main city. In the new areas of Dubai as well as the malls, you can probably get away with quite a lot (but that doesn't mean you should). Many Western females there wore short shorts, spaghetti straps, and other common summer styles. In Deira however (an older part of the city), my girlfriend was dressed very conservatively (long pants, long-sleeves, and all her shoulder/neck hidden) and still got full-body eye-glances from 90% of the men there (the souks there were almost exclusively male-populated as well). As far as PDA goes, I saw perhaps 1 in 10 couples holding hands in the malls and nothing more. In the malls and newer areas in Dubai you can probably get away with it but it's better to be respectful. For a more extreme case, in the Abu Dhabi Grand Mosque I put my arm around my girlfriend for a picture without thinking about it (completely friendly gesture, like I would do for any male friend for example) and we were told off politely. Prayer times probably will not interfere with most of the things you are doing around the city. Many places are closed during the day but there is still plenty to do. Historical places, mosques, and malls are still open. However, many souks will have odd hours or be closed entirely. Note that the Metro might have restricted hours (on Fridays it opened at 1 pm). Do not eat in public until after 6:45 - 7:00 pm. If you are an unmarried couple it might be a good idea to bring some fake wedding rings along. Many of the resort hotels probably won't ask you anything but you might get some questions if you are outside the newer Dubai areas. It is illegal to eat, drink or smoke in public during daylight hours (including in your car). Urban legend has it that you end up in jail for the remainder of the month of Ramadan if caught, however it is more likely that you'll get a lecture from the police and possibly a fine. The law says a fine up to 2000 / 2500 dhs or up to 1 or 2 month jail sentence as far as we know. Should you be hungry or thirsty you should be able to find an open supermarket with a food alley for non-muslims hidden in the back. It is respectful and polite to dress more conservatively during Ramadan - shoulders and legs should be covered, although it is apparent when walking around some of the shopping malls in Dubai that many people either don't know or don't bother. For more information see the Dubai FAQs website and this BBC Travel article on the topic. Not the answer you're looking for? Browse other questions tagged local-customs dubai islam ramadan or ask your own question. Travel in Morocco during Ramadan? How much is a traveler affected by Ramadan in Indonesia? How difficult is it to eat and drink during ramadan in Thailand and Malaysia? What clothing should I bring to Dubai during February? Need to get out of the airport during a 4 hour layover in Dubai? Flying via Dubai with antidepressants, what do I need?